Arsenal were back in Premier League action in another London derby, this time against Chelsea in the late Saturday kick-off. The home team were eager to get back on the winning track with a strong performance in front of the Arsenal fans. Unai Emery stated before the game that this was an opportunity to get closer to the target of the top four, and his side came out of the blocks quickly. The opening minutes saw the Gunners on the front front, with plenty of possession in the final third. Pierre-Emerick Aubameyang and Sokratis both had chances to get an early opener but failed to hit the target. Then Laurent Koscielny had a powerful header saved by Kepa in the Chelsea goal, it felt as if the goal was coming. And indeed it was; Hector Bellerín fired a ball into the box and Alex Lacazette turned brilliantly and rocketed his shot into the roof of the net to make it 1-0 to the Arsenal. Unai Emery’s team were well on top and pushed forward in search of the second. Aubameyang almost scored with a spectacular bicycle kick but his effort flew just wide of the upright. Soon after, the excellent Koscielny diverted a Sokratis cross past Kepa to double the Arsenal lead. The second half was a more even affair, with the away side pushing players forward in search of a way back into the match. Arsenal defended solidly and remained dangerous on the counter-attack, with Bellerín and Sead Kolasinac in particular proving to be constant threats down the wing. Unfortunately Bellerín seemed to suffer an injury to his knee and was stretchered off to applause from both sets of fans and signs of affection and concern from players on both teams. 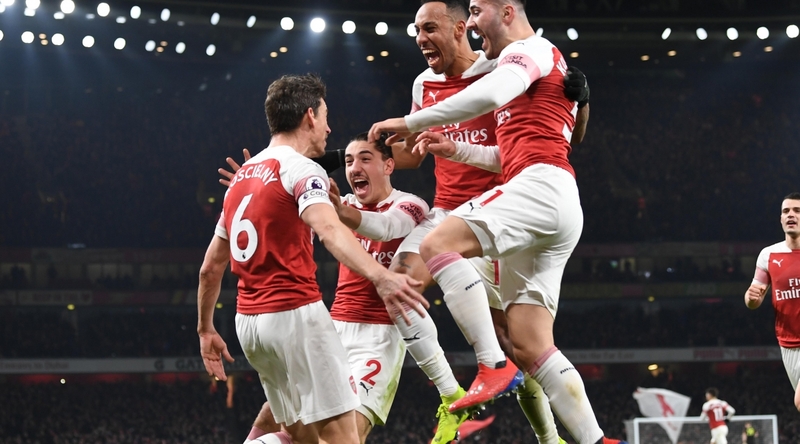 The match ended in a 2-0 win for Unai Emery’s Arsenal team, and the fans celebrated a very good performance and three more points. Arsenal will now focus on next Friday’s FA Cup tie against Manchester United at Emirates Stadium.